Athletes know that in order to reach peak fitness you have to put gas in the tank. What happens though, if you have a leak in your gas tank, or if your engine can’t take in gas, or if you flood your engine? You can kiss your chances of winning any race goodbye. If you want to increase your performance, then it’s time to stop worrying about just your macros and start worrying about your habits and behaviors around food. After all, every athlete knows that in order to do great, you have to know your race pace. It’s called conscious fitness. Why then doesn’t every athlete know about conscious nutrition? If you want to improve performance, then you have to optimize digestion, and it starts with the brain. If your brain doesn’t know that food is on the way, then how are you expecting the brain to tell your stomach to secrete more stomach acid or your pancreas to release digestive enzymes (aka prepare for digestion)? You already train hard and put your nervous system into sympathetic (fight or flight) mode, but in order to get into parasympathetic (rest and digest) mode, you have to learn to relax. One of the best ways to begin the digestive process is simply to smell your food slowly for about one minute. You took the time to make it, so sit down, take ten deep belly breaths in through your nose and out through your mouth to smell your food. When you do this you simultaneously accomplish two things. You put your body into a more parasympathetic state simply by breathing but you also tell your brain food is on the way by smelling it. Ever smell something delicious and immediately find yourself hungry? How about watching a commercial for pizza when you are starving? Your mouth waters, you start to crave food, and those digestive juices begin to flow. So, do yourself a favor, sit down and start practicing 10 deep breaths before every meal and you will begin to take more gas into your tank. After your brain knows food is on the way, and those digestive enzymes are flowing, you have to obviously get the food to those enzymes. Those enzymes are only going to work optimally on food with a larger surface area so, that’s where chewing comes into play. Having collected data on heart rate variability (HRV), subjective sleep quality as well as overall feelings of recovery from athletes at the highest level, chewing is one of the most undervalued habits athletes forget to develop. As a general guideline, chew 30 times per bite, but if you’re eating something like avocado, just think about making the food mushy. You’ll have an easier time absorbing the food you eat and more importantly, you won’t flood your engine because you will slow down. Speaking of eating slowly, when you eat fast and impair digestion, you essentially dampen your nervous system which stops you from fully expressing your fitness. In many cases you can mess up sleep as well as overall recovery too. Besides chewing 30 times per bite, another method to help improve absorbing the food you eat and not flooding your engine is to put your fork down every bite. This helps not only improve digestion, but also helps cue you in on satiety signals which help tremendously if you’re attempting to lean out. One final method to improve digestion as well as help you eat more slowly is to eat with friends and family. Humans are tribal creatures and we are wired to eat with other humans. So, sit down with your favorite people, find something to laugh, as well as smile about, while chowing down. You are NOT what you eat. You are what you eat, break down, absorb, and don’t excrete. 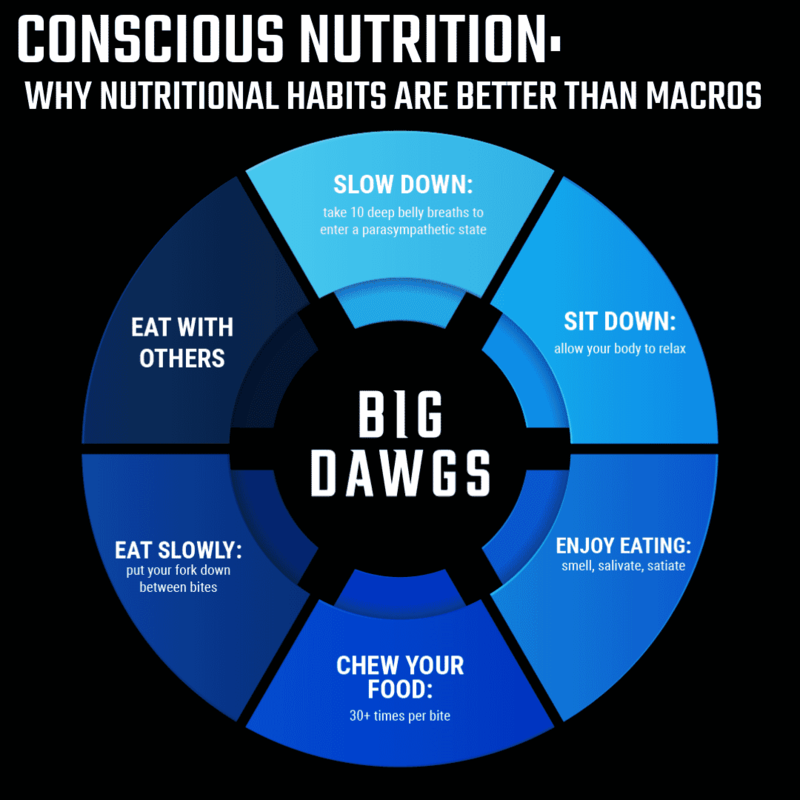 If you want to compete in today’s functional fitness realm, you need to be more conscious of not only how much you eat, but how you eat it.